We’ve all seen these monstrosities. They clutter our view of the landscape and distract drivers. 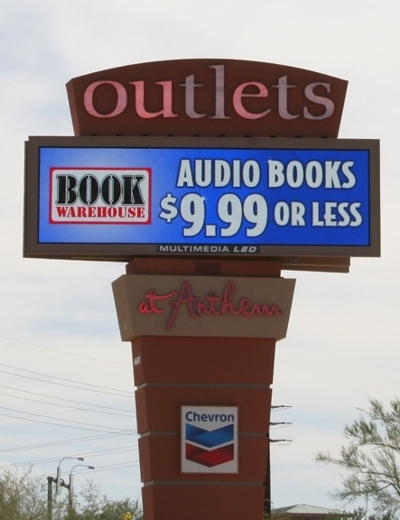 They’re commonly called electronic billboards, but the industry term is CVEMS (continuously variable electronic message signs) or EMD (electronic message displays). They’re also bad for astronomy. Much of the light they emit goes upward into the sky, adding to the already significant problem of light pollution. Fair warning … this is a rant, and at 800+ words, it’s longer than my usual posts. But this is a topic I’m passionate about, as it affects my hobby of astronomy. So please bear with me. They installed a huge CVEMS about a year ago at a mall 5 miles south of my home. It’s the brightest light I can see from my yard. The image above shows my new panorama to the southwest. The insert is a telephoto view of the sign. 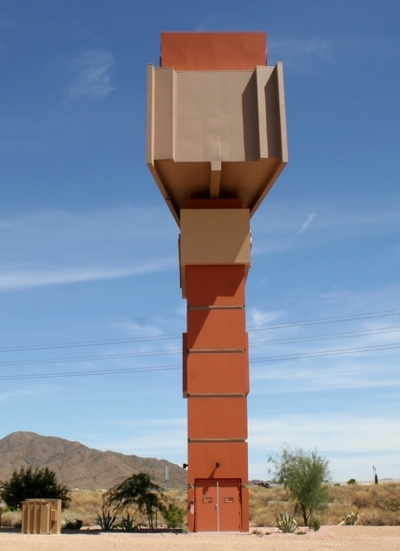 County Planning & Development tells me it’s three times brighter than their recommended level, but unfortunately, the sign is within Phoenix city limits, and Phoenix lighting ordinances trump the County. 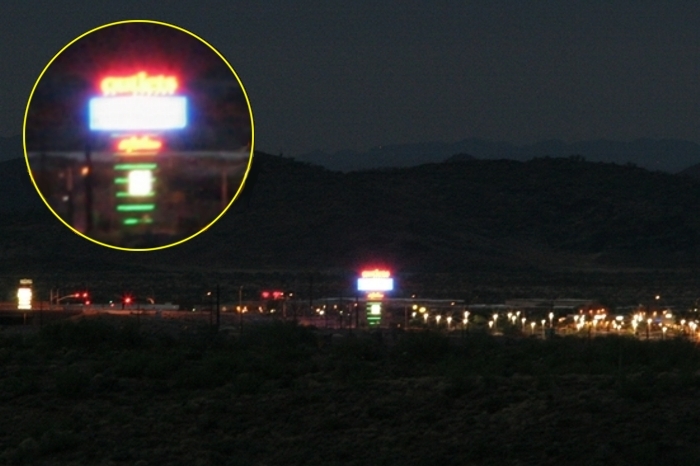 The reason they’re so bright is, unlike conventional billboards (which merely reflect light), a CVEMS emits its own light, much like a computer monitor or television. The display consists of clusters of red, green, and blue LEDs (light emitting diodes) that in proper combination can produce any color desired. 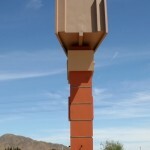 But unlike streetlights, yard lights, or conventional billboards, there’s no way to shield these things. Click on the left thumbnail below for a closer look at this sign. Advertisers and billboard companies love these things. Multiple customers can be accommodated on a single unit. The rotating ads grab your attention. [By federal standards: no more than one ad every 8 seconds, and no full-motion video.] And no more paying a crew to remove and glue paper. Changing an ad is no more difficult than changing a slide in a PowerPoint presentation. The whole operation is run from a computer interface. I’ve written about CVEMS before, in my last Nov 14th post. But I felt compelled to return to this subject, since HB 2757 is now winding its way through the Arizona Senate. It’s being fast-tracked by its proponents, even though it’s opposed by professional and amateur astronomers, environmentalists, and those who simply enjoy an uncluttered view of the beautiful scenery in this great state. HB 2757, if passed, would overturn some critical provisions in the Arizona Beautiful Highways Act of 1970, itself a spin-off of the federal Highway Beautification Act of 1965 spearheaded by Lady Bird Johnson. Specifically, HB 2757 would allow the use of variable lighting (read: rotating ads) on roads throughout the state. Click on the right thumbnail above for a larger view of the sign seen from the side. If you note the access doors, you’ll get a feel for just how big this sign is. You can actually take an internal spiral staircase to the top to service the electronics, and the AC required to keep those electronics cool. The entire system consumes close to 10 kW of electricity … enough to run 7-8 average homes. That’s a lot of energy that could be better used elsewhere. By comparison, a conventional billboard this size might use about 1 kilowatt. I spoke with an engineer at the company that manufactured this sign. He said it cost around $350,000. Beyond that, there are ongoing maintenance and electricity costs. The LEDs should last 5-6 years in this climate, providing they aren’t “overdriven” (run at their brightest level). As it turns out, the brightness is user-variable, and the brighter you run it, the sooner the LEDs will start failing, creating “blank pixels” like you sometimes see on other digital displays. There’s also a sensor that detects sunlight levels, and ramps the brightness down as it gets dark. But this feature is also user-variable, and not addressed by the Phoenix lighting code. 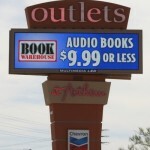 Naturally, sign owners are inclined to “turn up the volume” in an attempt to boost sales, and pass along the energy or LED lifetime costs of doing so. Another feature that’s user-variable is, of course, the ad content. It has been suggested that the impact of these signs could be mitigated by using light text on a dark background rather than the other way around. Look at the two messages below. Both have sufficient contrast to be easily readable, but the one on the right emits far more light. The companies that make CVEMS do recommend the scheme on the left, to save energy, increase LED lifetime, and reduce light pollution. Alas, few advertisers or CVEMS owners seem to be paying attention. This Sky Lights is dedicated to Howard Israel, Phoenix area Rep for the International Dark Sky Association. Howard has stepped down from that position because of health issues. We met at a stake-holders meeting where we collaborated on developing a model lighting ordinance for use by municipalities. We became friends as well as colleagues, and he spoke twice to my astronomy club over the last two years. Thanks, Howard, for all you’ve done to help us preserve our dark night sky. Your expertise, enthusiasm, and political activism as our IDA Rep will be sorely missed.